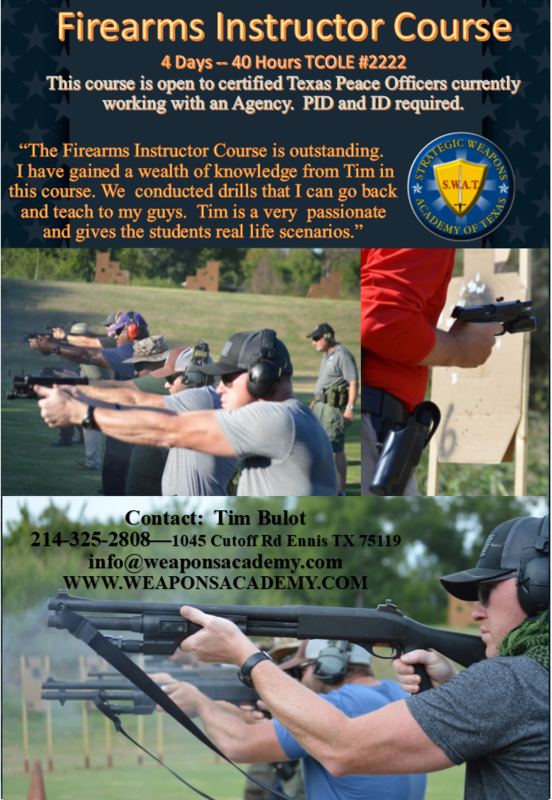 The Patrol Rifle Instructor Course is open to Certified Peace Officers who have completed the 2222 TCOLE Firearms Instructor Course and the 3322 Patrol Rifle Course. TCOLE reporting in cooperation with Navarro College Police Academy. The Patrol Rifle Instructor Course goes into detail above what is taught in our 3322 course, focusing on instructors who will be responsible for certifying, qualifying and conducting in-service training for Officers that carry the Patrol Rifle on duty. The course is 2 days, 24 hours. Day One: Begins with a theory session followed by range training. 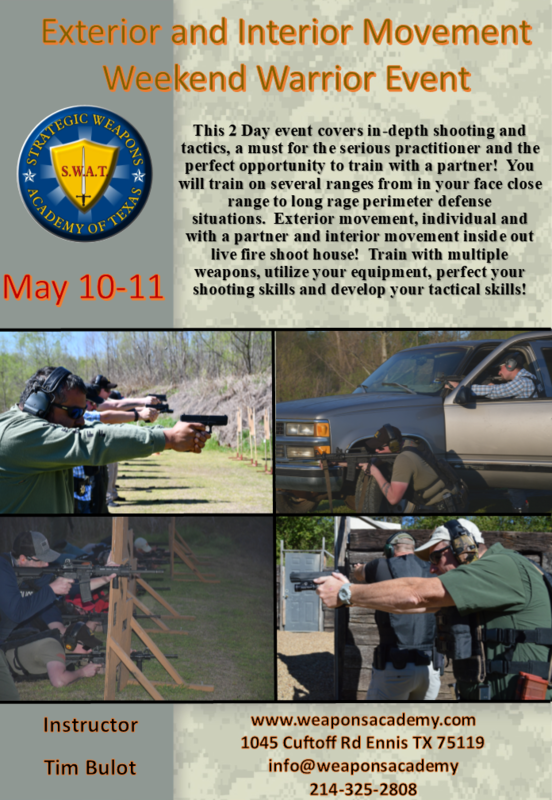 We will fire all of the drills taught in the basic course, plus intermediate and advanced drills for instructor level training. We will detail strip, inspect and clean the AR15 understanding what needs to be checked and maintained during regular inspection. Day Two: Focused on delivering the program, you will conducted a carefully critiqued demonstration, teach back and a written exam. Further a Qualification Course of fire out to 100 yards is required for successful completion and certification. Both days are long, fast paced and intense. Upon registration you will be provided with a list of drills to practice as well as the qualification course of fire. Tactical Sling — 1, 2 or 3 point. Weapons Academy made this course very interesting and fun. I Really like how all the information is made relevant and put into real life scenarios. Best training I’ve ever received. 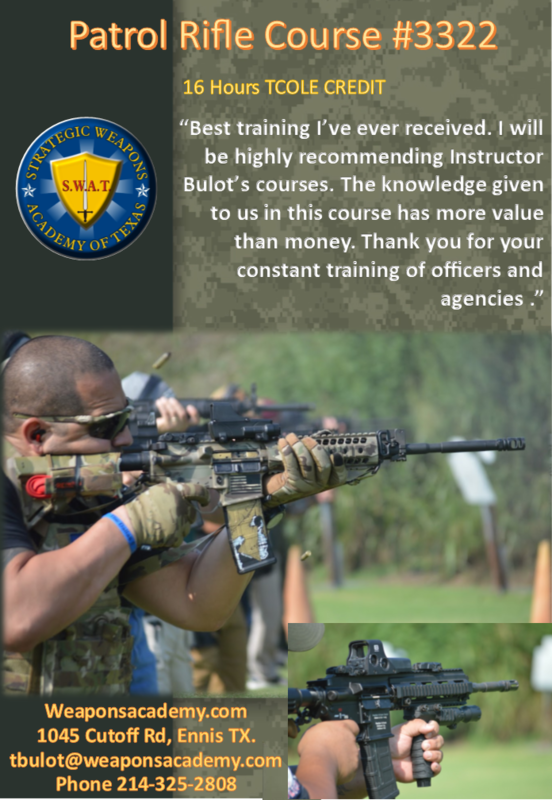 I will be highly recommending Instructor Bulot’s courses. The knowledge given to us in this course has more value than money. Thank you for your constant training of officers and agencies. The Firearms Instructor Course is outstanding. I have gained a wealth of knowledge from Tim in this course. We conducted drills that I can go back and teach to my guys. Tim is a very passionate and gives the students real life scenarios. Awesome class, with great instruction, Tim knows what he is talking about, and conveys his menages in a way that is easy to learn. Thank you Tim Bulot. This was a great learning experience. The instructor presented all information and hard on training very well. Great Job Tim Bulot. “Thank you so much for the teacher training event you presented yesterday. As an educator of over 32 years of staff training and staff development, I have never received such well planned and thought out training. I will recall, consider and practice the information and skills we gained yesterday. My take away from this was confidence. Confidence in myself, confidence in providing help if needed, confidence in learning about a topic that I had avoided for decades. Thank you for your training. Thank you for sharing and teaching and caring. Thank you to the numerous trained officers who volunteered to guide and train and who spent so much time with us. 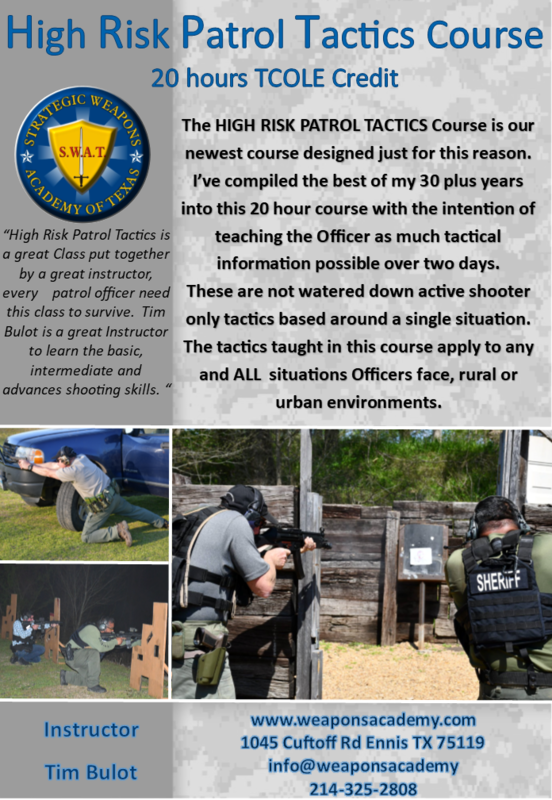 “High Risk Patrol Tactics is Amazing class, worth every minute. So much knowledge being shared and passed along. Thank you Tim Bulot for teaching us how to think outside the box so to say. Can’t wait to go to another class”.